Ah, Washington: evergreens, coffee, rock, and rain. That's pretty much it, right? Well, no. There is a whole lot of weird going on in our state. Washington is home to some of the weirdest travel destinations, scariest legends, and most colorful folks in the United States.Because there are so many odd and unusual tales, cemeteries, beasts, and people here, it took two authors to traverse the state to document it all. With cameras and notepads, and apples (of course) in hand, Jefferson Davis and Al Eufrasio boldly ventured the highways and byways, back roads and forests, shorelines and mountaintops to investigate all the state has to offer. For starters, there are lots of unexplained events here--in fact, we're ranked number two in the whole country for mysterious phenomena: America's only unsolved hijacking happened here; look up, but watch out for raining rocks, mysterious flying men, and UFOs; look down, and you might uncover a body turned to soap in Crescent Lake or deadly monsters in Lake Washington.Where else can you find a tribute to a giant squirting razor clam? Discover Ozette, our own Pompeii of the Pacific Northwest, cruise by Gospodor's monumental controversy on your way to Gravity Hill, but if that's Bigfoot you see, no worries because here in Washington, Bigfoot saves lives Investigate the elusive Northwest tree octopus, feed a hungry ghost at Starvation Heights, and see what's not going on in Aberdeen. 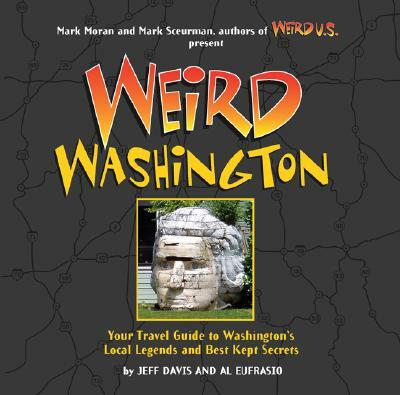 Yes, Washington is a whole lot weirder than you ever imagined, and "Weird Washington" is here to show and tell you all about it.